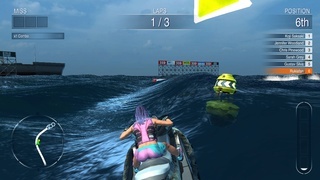 The gameplay is pretty good with a wide variety of environments and courses, decent water physics, and excellent controls. You'd think the game would be a fantastic title right? This is not necessarily the case as some of the visuals look like they were ripped straight from an N64 game, especially the characters and obstacles, however the background scenery and water looks nice. 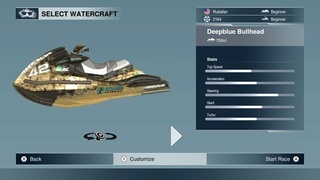 Another negative is that the avatar customization is extremely shallow, and the rubberband A.I. is a nightmare to deal with. You can literally play a perfect game and still lose at the last few seconds of the race. Thankfully this only happens once in a while, but it's still a bit annoying. The soundtrack and announcers are pretty good, but the game's biggest flaw is that there is no audio during off-TV play which is a dealbreaker for many people ourselves included. 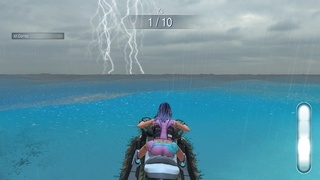 That said the game can be fun at times so if you like the genre you might enjoy Aqua Moto Racing Utopia, but just know that it has its share of flaws. 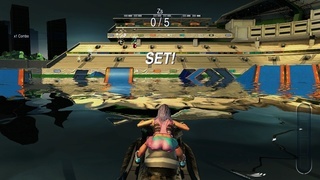 With good gameplay, a sizeable amount of content, excellent controls, and a decent audio presentation, Aqua Moto Racing Utopia had potential to be a fantastic game, but mediocre visuals and terribly cheap A.I. severely hampered the game's overall polish as did the lack of audio during off-TV play and as such we give this game only a decent level of recommendation. No audio during off-tv play? Nope not going to buy lol. I wonder if the developer even knows that the audio doesn't play through the gamepad? Nice review. @Aqua Cherry Blossom I would imagine they don't. Thanks for warning us about the audio bug. I will still purchase the game since I don't plan to play off-tv. 6/10 seems generous given the lack of audio during off-tv play. When this release in Japan on Wii U?